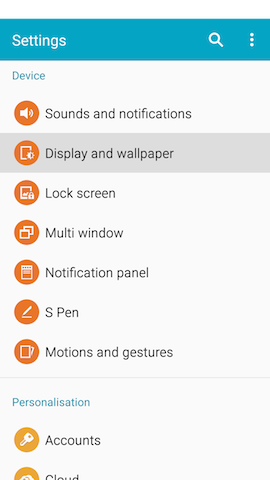 Android™ 5.0, Lollipop: How do I use my Samsung Galaxy Note® 4 with one hand? 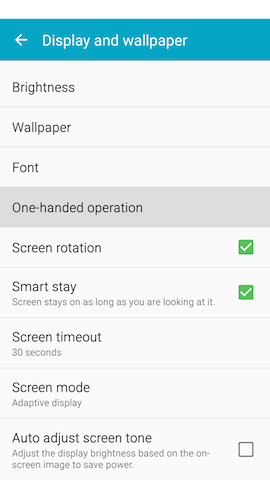 You have access to several features that make it more convenient to operate your phone with only one hand. 5. 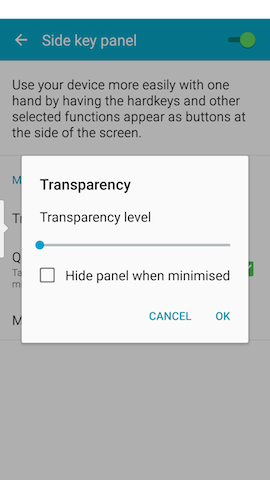 Touch Reduce screen size and touch the slider to turn Reduce screen size on . 6. 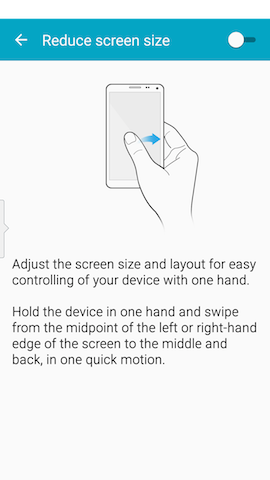 Turn on the feature at any time by swiping your thumb from the edge of the screen to the middle and back. 7. The display will reduce to a size where you can reach most features with your thumb. The icons at the bottom of the screen put the Recent apps, Home, Back, and Volume buttons within easier reach of your thumb. 8. You can resize the screen by touching and dragging in the top corner of the window. Touch and hold the top bar to move the smaller window around the screen. 9. 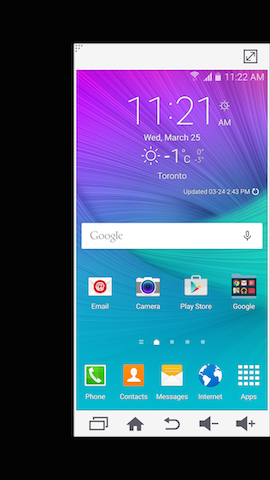 Touch to return to the full-screen display. 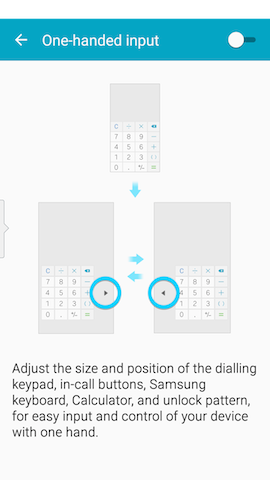 Adjust the size and position of input controls, such as the dialing keypad, calculator, and keyboards, so that they are easier to use with one-handed operation. 4. Touch One-handed operation . 5. 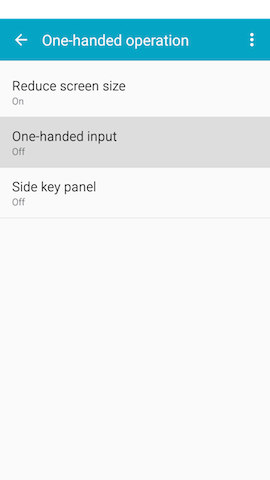 Touch One-handed input and touch the slider to turn One-handed input on . 6. 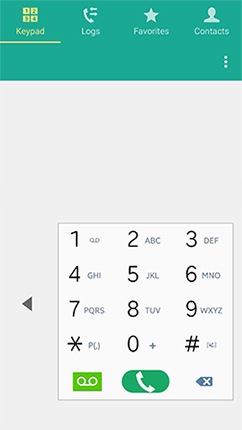 Below is an example of the dialing keypad with One-handed input turned on. The keypad is smaller, and you can touch the arrow to move it to the other side of the screen. Display up to four quick access buttons within easy reach of your thumb by turning on the Side key panel. 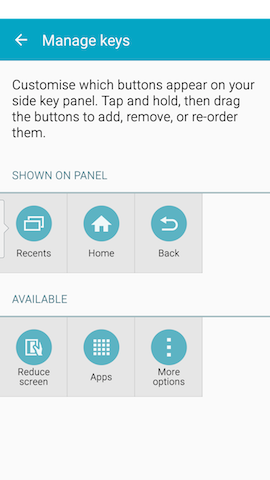 The panel can include the Recent apps, Home, and Back keys, as well as quick access to the Reduce screen size feature, the Apps menu, and More options (if available for the content you are viewing). 5. Touch Side key panel and touch the slider to turn Side key panel on . 6. Move the panel around the screen by touching and holding and then dragging it to a new location. 7. 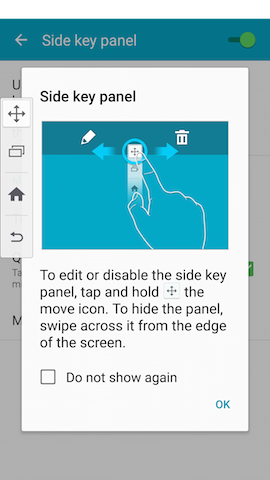 To remove the Side key panel, touch and hold and drag it to Remove at the top of the screen. 1. Touch Transparency in the Side key panel settings, and move the slider to increase or decrease the transparency of the panel. Mark the Hide panel when minimized checkbox to have the panel disappear completely when minimized. 2. The Quick minimise checkbox is marked by default. When you touch the screen outside of the panel, the buttons are minimized to a white line on the side of the screen. Unmark the checkbox to keep the panel open at all times. Note: To access the panel after minimizing it, swipe the edge of the screen where the panel was last displayed. 3. 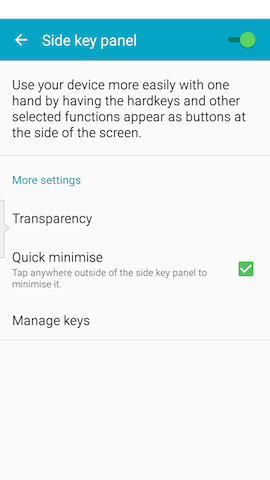 Touch Manage keys to edit which keys are displayed in the Side key panel. Touch and drag a key to add or remove it from the panel, or to rearrange the order of the keys.